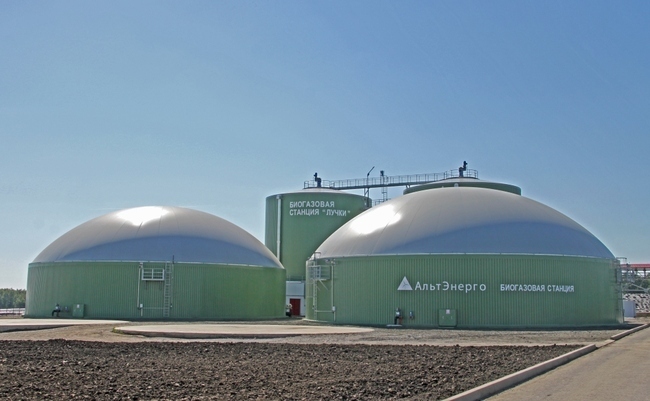 In Belgorod region AltEnergo Company became the first one in Russia to obtain a qualifying certificate for a generating facility, which runs on biogas technologies – the biogas power plant Luchki. The first industrial biogas plant in the country with the installed capacity of 2400 kW was built in the Prokhorovskiy district of Belgorod region for processing the waste products of the meatware plant and selection & hybrid center Agro-Belogorye. It should be reminded that the grand opening of the plant took place in September 2012. The expert qualification report was prepared by the non-commercial partnership Market Council. Altogether the procedure lasted about nine months. During this period of time the biogas plant Luchki was included into the “Scheme of location of power generating objects using renewable energy sources in the territory of the Russian Federation” adopted by the Minenergo Of Russia and obtained the act of compliance of the automated measuring and information system for electric power fiscal accounting with the technical requirements of the A+ class wholesale electric power and capacity market. In accordance with the legislation of the Russian Federation, the obligatory condition for a generating object to successfully pass the qualifying procedure is its functioning on the basis of using exclusively renewable energy sources, being in operation, being included into the scheme of location of renewable energy generating facilities, connection to the power grids and availability of the automated measuring and information system for electric power fiscal accounting of the highest class – A+. The experts believe that so far the qualifying procedure is quite lengthy and expensive. This has to do with a number of contradictions and long terms of regulation procedures. However thanks to the staff of the Market Council it was shortened to the maximum possible extent.